The Yagodina Cave is located in the Buynovo Gorge near the Rhodoope village of Yagodina. It is one of the most famous and most-visited caves in Bulgaria. Its galleries extend to a length of 8,501 meters, which makes it the 4th longest cave in Bulgaria and the longest in the Rhodopes. The temperature in the cave is between 6 and 8 degrees all year round, and it has a humidity of more than 90% (as do most caves). The Yagodina Cave is a multi-level complex, primarily marble. The lowest level has been developed, but the cave has another two connected levels. The tourist route enters and exits through two artifial openings. The cave’s natural mouth is a kilometer farther down the Buynovo River, where artifacts from the Neolothic Age (both the Stone Age and the Bronze Age) have been discovered. Among these finds are earthenware plates, work implements, and an earthenware oven. Studies have shown that the master potters lived in this region collected clay from the cave. After the cave mouth was excavated and restored, it was turned into a museum exhibit. The gallery where visitors begin their itinerary is known as New Year’s Hall. Here spelunkers and their guests from neighboring regions gather to welcome the new year, and they also put up a real Christmas tree in the hall. The next hall is The Wedding Chapel, where couples can exchange their matrimonial vows. It is fitted with an altar and attractive wall decorations to lend the hall a more ceremonial appearance. The itinerary continues for another kilometer, affording visitors the opportunity to observe almost every type of cave formation, but most impressive are the many cave pearls. They are formed as real pearls are, beginning with grains of sand that fall into the water and then are are coated with layer after layer of calcite, year after year, which is how they become round. 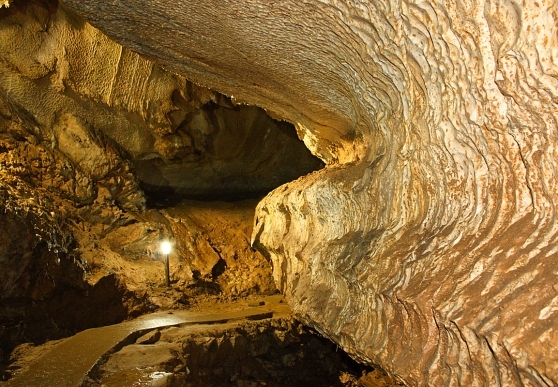 Besides the standard tourist route, Rhodope Tourist Association guides offer excursions through the wild, undeveloped galleries at The Yagodina Cave. These parts of the cave, which can only be entered with the help of special equipment, offer unusual and entrancing vistas that remain hidden to most visitors. Excursions to the unlit parts of the Yagodina Cave are extreme tourism that require strength and stamina, but the beautiful views make the effort well worthwhile.